Are you looking for a place to hold a business meeting, monthly meetings, family reunion, bridal or baby shower? Consider the ETCC! Rates listed are during regular open hours. After hours rentals will include a security and staff charge of $20 an hour. The entire building is equipped with wireless high speed internet. If you would like to schedule an event or rent a meeting room, contact Zlata Garrison at 335-ETCC. Most former students and faculty would not recognize this top floor room! Now as an open floor plan, this grand multipurpose room is perfect for larger gatherings. The elevator conveniently opens directly into this room to allow for easy access from the main lobby. Arrangements of tables allow for seating of 64 people. A kitchenette is equipped with a refrigerator and microwave. To view 360 degree videos of this room, click here. The ETCC Board Room is perfect for small business meetings (up to 15 people). The room is equipped with wireless high speed internet. We have a commercial kitchen available for rental. If your are interested in renting the kitchen, please contact Zlata with your dates. ETCC has two meeting rooms that adapt to many types of meetings, programs and classes. Both rooms accommodate 40. Tables, chairs, white boards, and wireless internet are included with the rental fees. Contact us today to schedule your group for this room. Although the community room will be free to approved 5013c organizations such as 4-H and scouts, this room can be rented for other gatherings. This room accommodates 20 comfortably around the large table. The large table allows for interaction among attendees. A large dry erase board is mounted on the east wall for easy viewing. Looking for a place for team basketball practice or a church volleyball league? Contact ETCC to schedule the dates and times needed as early as possible since spots fill-up fast. With the original bleachers still in place, the ETCC gym is also a great place for larger presentations or meetings. 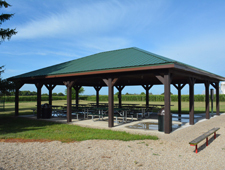 If a reservation notice is not posted the shelter is available on a first-come, first-served basis at no charge. Parties without shelter reservations must vacate the shelter if a party with a reservation for that day and time arrives. Reservations may be made one (1) year in advance of today’s date. Applicants must be 18 years of age or older to reserve a shelter. Resident rate: No ChargeNon resident rate: $40 half day, $55 full day Deposit: A $35 deposit is required for both residents and non residents. The deposit will be returned when staff verifies that the shelter is clean and in good condition. Full payments are due at the time of reservation, check or cash only. - Supervision of minors is required at all times. - Fires not permitted. There is a grill for use with charcoal only. - Pets are allowed, but must be on a leash no longer than eight (8) feet or suitably caged. You must clean-up after pets. - Posting of signs is prohibited. The use of tape, glue, nails, tacks, screws, staples or other fasteners that may scratch or otherwise damage surfaces of the shelter, tables, or other equipment are prohibited. - The area must be cleaned prior to departures. Trash receptacles are provided. - Park in designated areas only, no parking on the grass.